Transfer the star pattern (download it here and print at 100%) to the back of your iron-on adhesive. 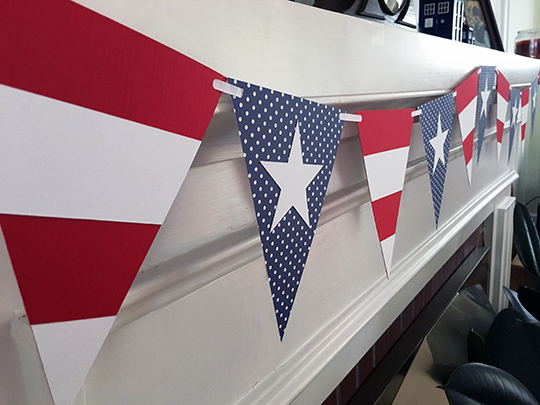 Apply the adhesive to the back of the white fabric and cut out the stars. Fold each of the blue rectangles in half, long edges together, and finger press to mark a center line. Unfold and refold with the short edges together and finger press. Center a star at the intersection of the two lines.Measure up 1-1/4″ from the center star and place another star. Measure down 1-1/4″ from the center star and place one more. Iron the stars in place to secure them, then zigzag around the edges with a narrow stitch to keep them from fraying. Sew the stripes together with a 1/2″ seam. Each placemat should have three red stripes and two white ones. Press the seams toward the red fabric. 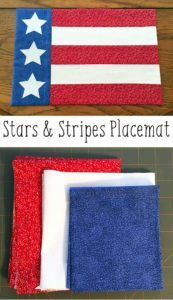 Square up the edges if needed and sew a blue star panel to each set of stripes. Press the seam toward the blue fabric. Center the fusible fleece on the back side of the placemat top and fuse it in place. Pin a placemat front and placemat back together, right sides facing, and sew them together next to the edge of the fleece, leaving a 3″ opening along one red stripe for turning. Turn the placemats right side out. Turn the open edge under and press, then handstitch closed. I love this project for summertime tables. It looks great!